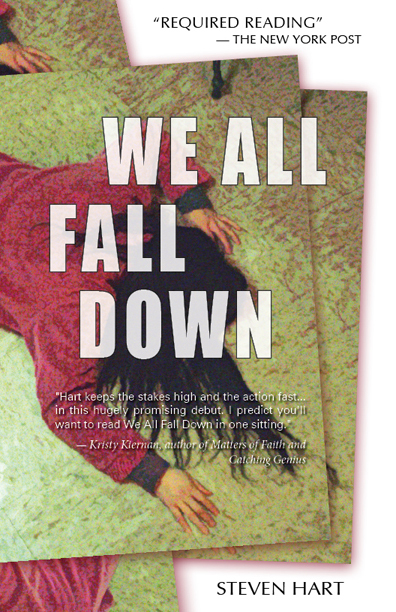 We All Fall Down, Steven Hart’s first novel, is now available in paperback from Black Angel Press. Black Angel Press catalogue page. Get the Kindle e-book edition. 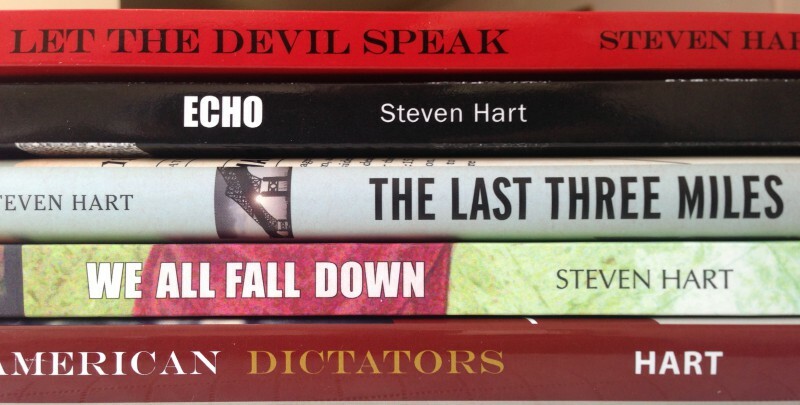 Breaking Cover and The Devil’s Right Hand. author of Matters of Faith and Catching Genius. Q: The heroine of We All Fall Down is a woman police officer struggling to get respect in the police force of a small New Jersey town. Aren’t we done with that kind of sexism? Aren’t women fully accepted as police? A: Women have broken through the barriers in city police forces, but many suburban towns have yet to see their first female recruits, while others are losing their women cops to retirement. The more forward-thinking police chiefs recognize the advantages of having women officers, but the battle is far from over. The sexism is still there, though it can be expressed in more subtle and ambiguous ways. Q: But the television cop shows are full of women officers. A: Yeah, well . . . television. You see lots of women officers who look like fashion models and run around with impractical clothing and hairstyles. I wanted to show something more realistic. Q: Is Karen McCarthy based on any real officers? A: She is a composite of a few officers I knew as a reporter covering several suburban towns. I couldn’t believe the flak they got from some of the men on the force. Q: What kind of flak? A: One of the direct inspirations for the novel was a sexual harassment case involving a woman officer in Middlesex County. 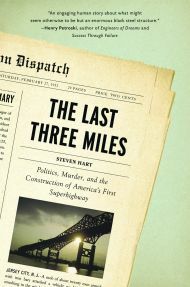 This was not a backward town — we’re talking about subdivisions full of financial executives who commuted to New York. But this woman was relentlessly attacked over her looks and her femininity by the other cops. Her health suffered. She even got plastic surgery in the hopes of ending the abuse. I read the court documents. The details were so ugly that the town settled out of court rather than go to a jury. She would have ended up owning the town. A: Someone with knowledge of the case — someone acquainted with the woman and the police force in question — came to one of my readings and told me the rest of the story. Suffice to say the woman took her money, moved to a new town, and started a new career — not in law enforcement. Probably a loss for the town. Q: What else inspires a story like this? A: The opening of the novel — the incident that gets the plots gears turning and rumbling — was inspired by a incident in which the owners of a jewelry store accidentally shot and killed his wife while fending off a robbery. The dead woman’s family accused him of murdering her and trying to make it look like an accident. The idea of using a crime to cover up another crime stayed with me. Q: Why are you so tough on cops? A: I have complete respect for the police. They accept the responsibility for dealing with situations you or I would gladly avoid. They see people at their worst, and they have to keep that darkness from coloring their personalities. They are also a far more varied and interesting bunch than most people realize. But there are bad cops out there. I won’t pretend I haven’t seen some of the things I’ve seen.